A crucial part of any loft solution. 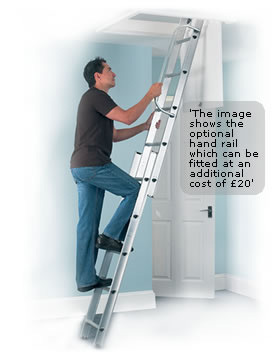 We offer a wide range of ladders. Included in the Example Package, this is a serviceable and popular ladder being British Standard kite marked. It is a light use ladder with a 150kg (23.6 stone) safe working load. It is manually operated but has a "yoke" style guide that keeps it on line while stowing or deploying.